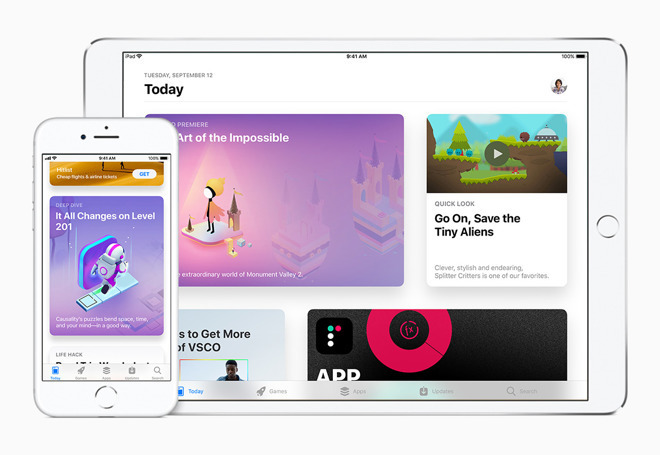 Just a week after iOS 11 was launched to the public, Apple has quickly followed up with iOS 11.0.1, a small update intended to address bugs and fix various issues with the software. Release notes accompanying iOS 11.0.1 simply state that the update "includes bug fixes and improvements for your iPhone or iPad." There are two builds of the software: 15A402 for current iPhones and iPads, and build 15A403 for the forthcoming iPhone X.
iOS 11 includes a new voice for Siri, as well as the ARKit tools that developers can use to create advanced augmented reality applications. It also boasts a redesigned App Store, and various features like Do Not Disturb While Driving and a revamped Music app. On the iPad, iOS 11 brings an all-new app dock that can be used for multitasking and app switching, as well as dragging and dropping files in between applications. iOS 11 is compatible with the iPhone 5s and newer, the iPad 2 and up, the iPad Air and newer, and all iPad Pros. It is also compatible with the sixth-generation iPod touch.